The 2" Camera Strap in harmony from Capturing Couture is an adjustable length strap for holding your camera. It consists of a 30" long decorative band and features two 3/8" wide, 12 to 14" long adjustable nylon webbing. 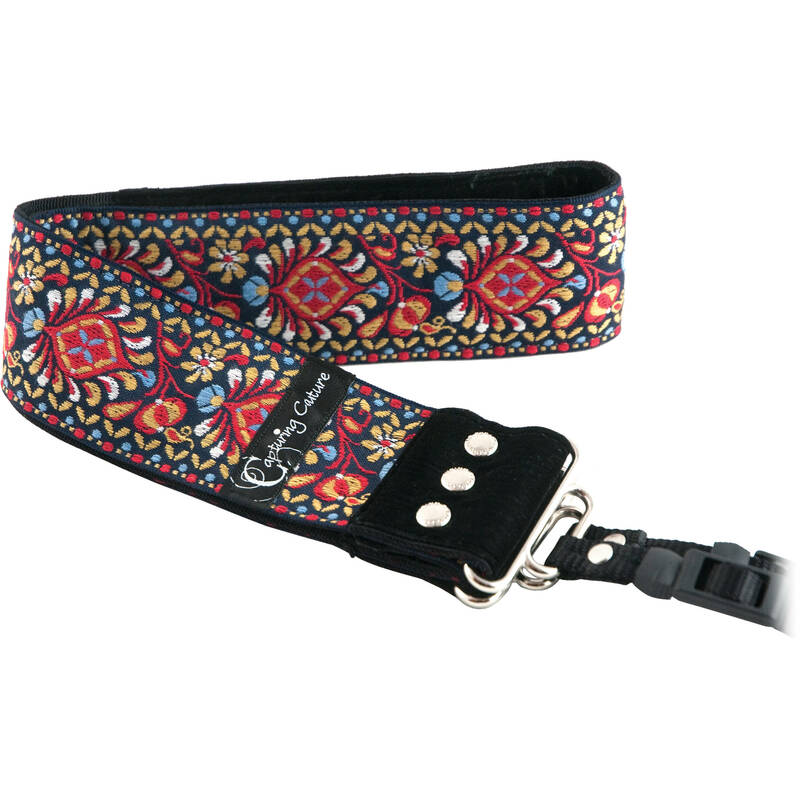 The 2" wide strap is made of decorative polyester ribbon. For comfort against your neck, the inside is made from polyester velvet with neoprene padding. The strap connects to your camera with slide locks. Including the 14" nylon belts, the strap provides a total length of 59". This allows you to wear the strap across your body messenger-style as well as around your neck. Box Dimensions (LxWxH) 9.0 x 2.5 x 2.0"
2" Camera Strap (Harmony) is rated 4.8 out of 5 by 77. Rated 4 out of 5 by Scuffy from Love It!! I was looking for a way to spruce up my Nikon and the Harmony strap did the job. I was tired of the bright yellow Nikon strap screaming the brand of camera. I've gotten so many compliments on it so far, and I've only had it for a week or two. The straps are easily adjusted and allow the camera to rest comfortably. Although the edges of the strap seem to be melted fabric (instead of having an inside-out stitched seam) which is slighty irritating on the neck. There is, however, a soft strip of velvet at the back of the neck which also helps! All in all, it's a great way to accessorize the camera and make it more personalized! Rated 3 out of 5 by KOParazzi from Pretty but not so practical I am a semi-pro photographer that just got this super cool looking new strap. I am very happy with the looks, but not as happy with the practicality of it. It seems a little home-made. The decor fabric is wider than the actual strap in places which causes it to dig into your neck while wearing your camera. I wore it to photograph a children's birthday party yesterday & came home with rug burn looking marks on my neck. The velvet padded area is a nice idea, but should maybe be wider to prevent the fabric rubbing. Overall, I do like the look of the strap & it seems to be durable. I just wish that they would have filed the sharper edges of the fabric, or made the outside seem folded under so that it wouldn't rub on my neck. It is also possible that I just got a bad strap. Rated 5 out of 5 by Anonymous from I hate camera straps... I hate camera straps. I have never used them. I'd prefer to carry the camera than to have it hanging around my neck. The straps are uncomfortable and dig into my neck. The Navajo camera strap has changed all that. This one is comfortable and long enough that the camera is not banging into my chest as I walk. Rated 5 out of 5 by Anonymous from Always Good The Navajo strap is a perfect fit for me and the prompt delivery and shopping experience is something I have become accustomed to at B&H. As usual a solid 5 stars! Rated 5 out of 5 by Mel from Absolutely love this strap I got this for Christmas last year; after wearing it for 9 months, I can say I love it! It's long enough to wear across the shoulders like a sling and still be comfortable, even shoot with it like that. I hate wearing them around my neck, and it's just not comfortable to wear it over one shoulder when walking. Inside the strap, around the neck is a velvet liner, with lots of padding. I love the funky design in the embroidery. It has a nice 60s vibe. I also love that it doesn't say NIKON or CANON in big obnoxious letters. Rated 5 out of 5 by Melany from One of my favorite straps I have 2 straps by Artisan Collection - Navajo Red (on my film camera) and Harmony (on my DSLR) These are well made, long enough to wear across my body (instead of just slung over a shoulder) and very pretty. They are padded at the shoulder, and have a soft velour-type material there as well so they don't rub or irritate the skin. I've tried other straps, but these have everything I want in a camera strap. I like the stylish colors prints on the straps, much better than the generic straps that come with many DSLRs. Rated 4 out of 5 by Anonymous from Besides the straps it was perfect! I love the print and it goes great with my new camera! It is cute, funky, and the inside of the straps have comfortable padding so the person wearing it does not irritate the skin on their neck with itchy fabric. The only issue I had with the product is that the straps were a little long for my liking. When I adjusted them I ended up having to cut the extra string off because it was flapping when I went to take a picture. I recommend this to fellow picture takers like me any day. How much weight can this hold? I have a Canon 5D Mark II. Let's say I have a 28-135mm lens and an external flash on it. Will the strap support the weight? The Capturing Couture strap bases are constructed with premium grade Nylon webbing that is the highest quality on the market and tensile strength rated at 4,000lbs +. A Canon 5D Mark II and 28-135mm lens with flash will most certainly be supported by this strap. According to the manufacturer, the Capturing Couture Symphony and other versions of their camera straps are produced from premium grade Nylon webbing that is the highest quality on the market and tensile strength rated at 4,000 lbs+. This strap will support a DSLR with a 600mm lens attached.